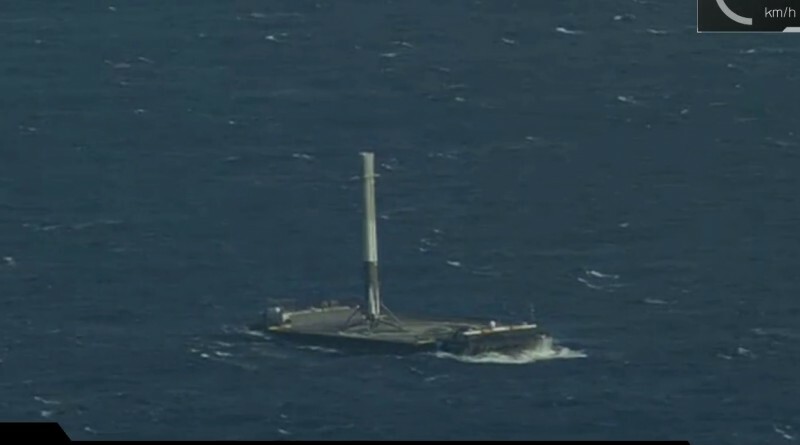 Falcon 9, successfully completing its primary mission of sending Dragon on its way, again attempted a landing of its first stage on the Autonomous Spaceport Drone Ship in SpaceX’s ongoing endeavors to perfect a booster recovery at sea. 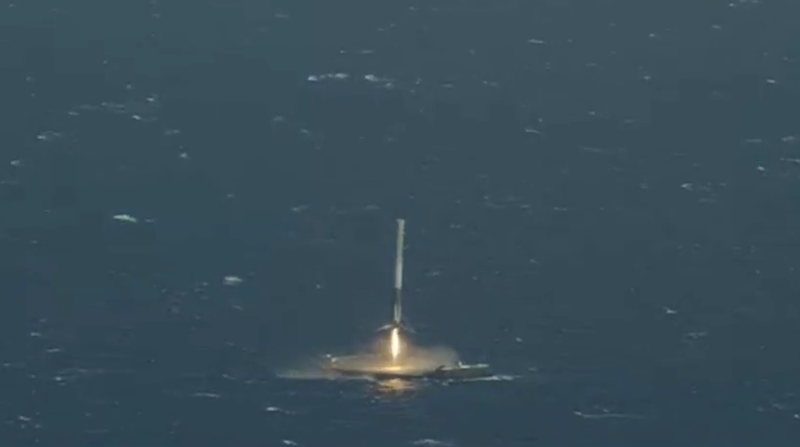 Returning to the Atlantic from the edge space and over five times the speed of sound, the booster came in on target and touched down on the drone ship, remaining upright to put the exclamation point on another milestone achieved by SpaceX. 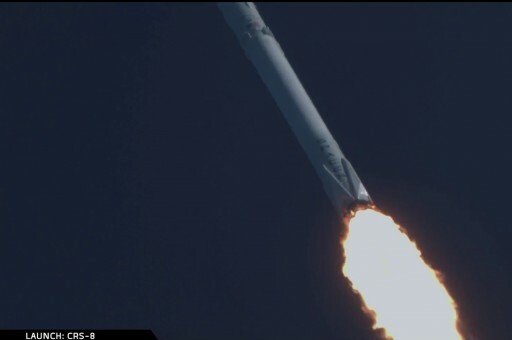 Falcon 9 lifted off from Space Launch Complex 40 at 20:43 UTC under the loud thunder of its nine Merlin 1D engines. After a brief vertical climb, the 70-meter tall rocket began heading to the north-east for a fast flight across the Atlantic to send Dragon and over three metric tons of cargo to the Space Station. The first stage fired its engines for two and a half minutes before handing off to the second stage for a seven-minute burn of its MVac engine to finish boosting the stack into orbit. Dragon was separated ten and a half minutes into the flight and successfully deployed its two power-generating solar arrays to head off on a one-and-a-half-day link-up with the Space Station for arrival on Sunday to join the Cygnus OA-6 cargo craft already attached to ISS. 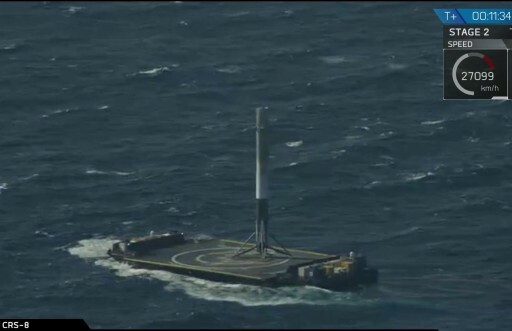 Separating from the second stage, the Falcon 9 booster was set for SpaceX’s next attempt of recovering a rocket stage at sea using the company’s Autonomous Spaceport Drone Ship located 300 Kilometers north east of the launch site and precisely holding its position in the ocean. The first stage successfully executed a partial boost-back maneuver to control its downrange travel distance followed by a short re-entry burn. 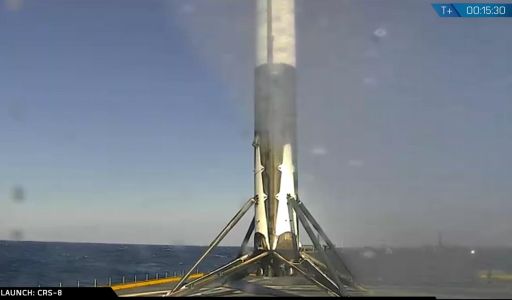 Guiding itself to the drone ship using four actuated grid-fins, Falcon 9 fired up its center engine and arced toward the steel deck of the ASDS, slowly swaying in the waves. 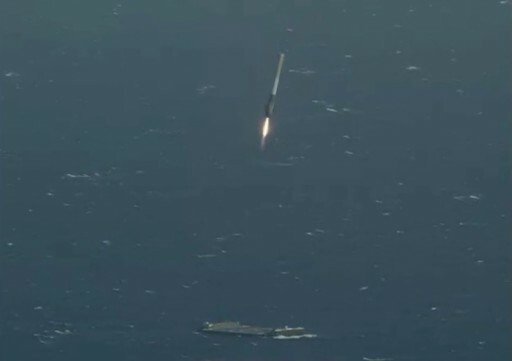 Touchdown occurred nine minutes after launch when the blackened booster came to rest on its four landing legs – further cementing SpaceX’s place in space history with a successful rocket stage recovery at sea. Final preparations for Friday’s launch picked up on Thursday when Falcon 9 was cleared for liftoff after a clean Launch Readiness Review and headed into late cargo loading – a unique capability of the Dragon spacecraft allowing items to be stowed inside the vehicle within one day of liftoff. Late load items for this mission included a Rodent Transporter with 20 mice for an investigation into bone and muscle loss remedies, fresh food for the crew, and time-critical samples for biological studies. All in all, Dragon is loaded with 3,136 Kilograms of cargo including food and supplies for the crew, systems hardware to keep ISS in ship shape and plenty of scientific experiments, supporting dozens of the 250 studies ongoing during the current ISS increment. Riding to the Station inside Dragon’s Trunk Section is the Bigelow Expandable Activity Module, set for a two-year stay to demonstrate expandable habitat technology in the space environment to pave the way for future missions of large inflatable modules. 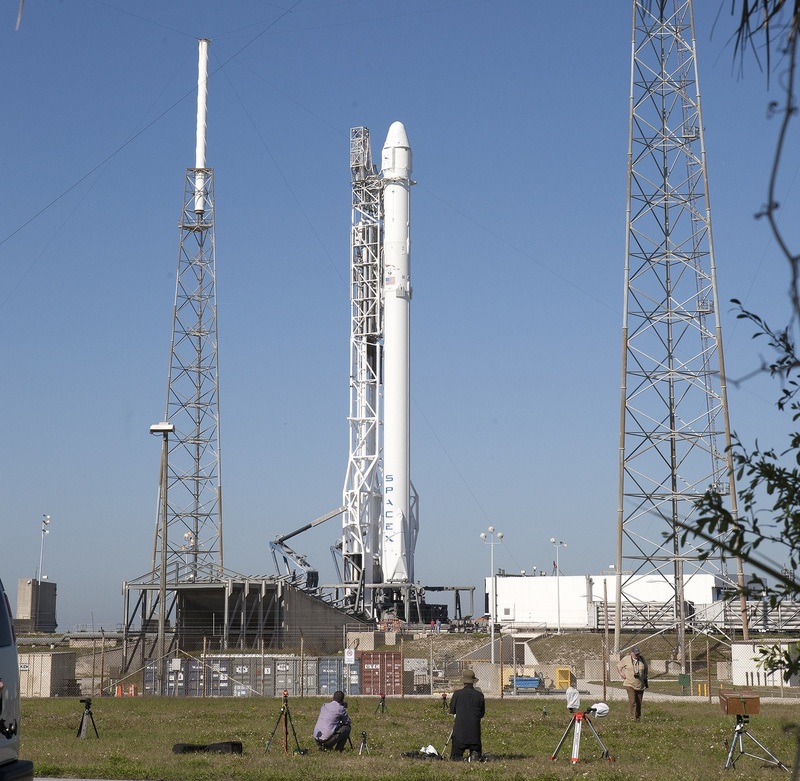 Preparing for Dragon’s first ride on the powerful Falcon 9 Full Thrust variant, teams raised the launch vehicle to its vertical launch position by 9a.m. local time on Friday, pressing into a long eight-hour countdown operation starting with the activation of the rocket’s subsystems for a multi-hour testing operation. At L-4 hours, the Range Countdown picked up as controllers set up range instrumentation and started monitoring the clearance of the launch corridor. 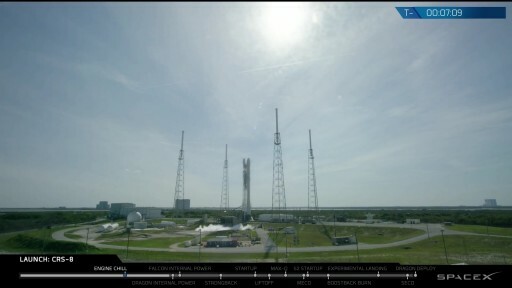 By L-3 hours, the Falcon 9 and its pad systems had been buttoned up and teams departed the launch area to clear the way for final setup steps of the ground-based propellant systems. Because of the unique characteristics of the Falcon 9 FT with its use of chilled propellants, the tanking sequence had to be compressed, making the business end of the Falcon 9 countdown all the more eventful. With a clean vehicle and excellent weather outlook, the launch team headed into the final hour of the count, loading a modified flight profile into the computers of Falcon 9, adjusted for the day’s Upper Level Winds. At T-38 minutes, the entire Launch Team was polled for a Go/No Go to head into the Tanking Sequence and a unanimous GO was given to pick up the Automated Countdown Sequence. Starting at T-35 Minutes, Falcon 9 entered the fast-paced propellant loading sequence with a brief chilldown before its tanks were filled with over 500 metric tons of Liquid Oxygen, cooled below its boiling point to -207°C, and Rocket Propellant 1 chilled to around -7°C. 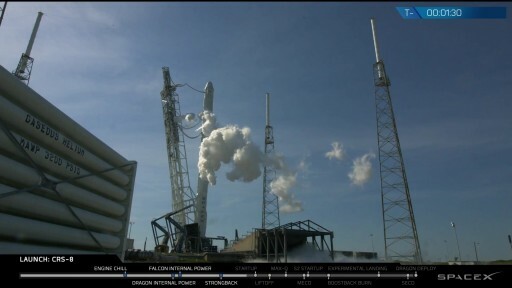 Because the density of Liquid Oxygen rapidly decreases as the oxidizer warms up, SpaceX has to launch soon after propellants reach flight level in order to keep the stages at flight mass and avoid any thermal/density gradients from building up. 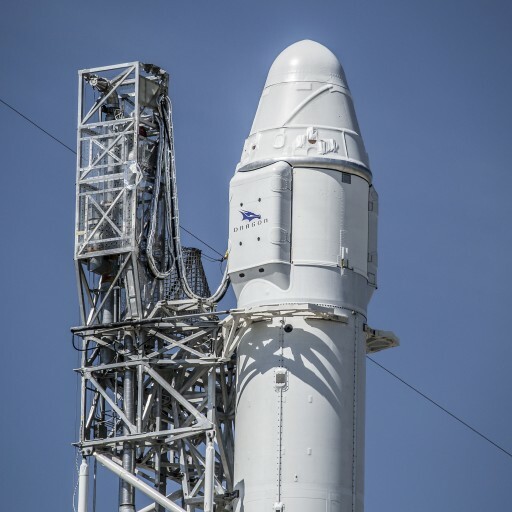 While propellants were rapidly filling the rocket’s tanks, Dragon transitioned to internal power and configured its Flight Control System for liftoff under close watch by the Flight Control Team in Hawthorne, California. No issues occurred at any point and the countdown entered its final sequence, all while the tanks were still in the process of being filled, a task most rockets finish with minutes or even hours to spare, but not Falcon 9. Liquid Oxygen loading reached flight level just around two minutes ahead of launch. With tanking nearly complete, the Strongback structure was retracted from the 641-metric-ton rocket to clear way for liftoff. Moving through the final critical steps of the countdown, Falcon 9 chilled its engines for ignition, switched both stages to internal power, armed its Flight Termination System, pressurized its tanks and assumed control of the countdown at T-1 minute when the Flight Computer started up. 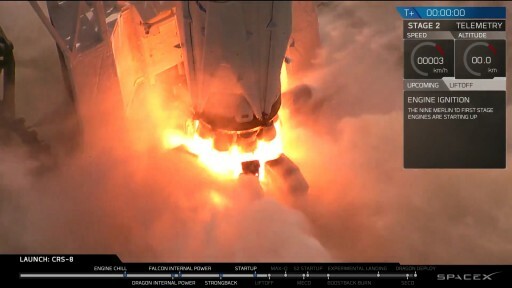 Falcon 9 rumbled to life three seconds before T-0 when the nine Merlin 1D engines were commanded to ignite and the characteristic green flames of Falcon’s igniter mixture erupted from the engines as turbopumps spun up and combustion was triggered within the nine engine chambers. Roaring to a launch thrust of 694 metric ton force, Falcon 9 lifted off at precisely 20:43:32 UTC – the moment when the Earth’s rotation positioned the Cape Launch Site into the orbital plane of the Space Station. Falcon 9 balanced in a vertical posture for the first 15 seconds of the flight, clearing the pad’s lightning towers before starting its pitch kick and roll maneuver to align itself with a north-easterly flight path. 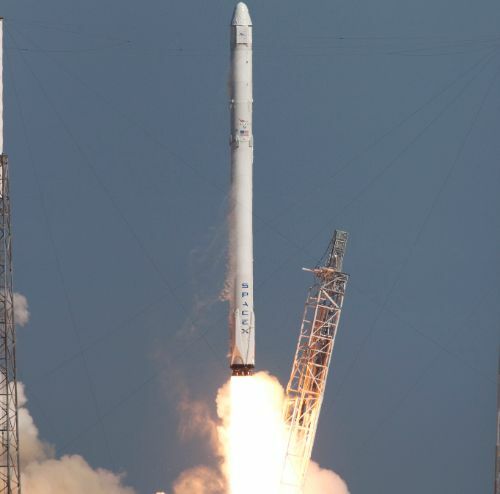 The nine Merlin 1D engines, in total burning around 2,200 Kilograms of propellant per second, quickly accelerated Falcon 9 to the speed of sound and the vehicle encountered Maximum Dynamic Pressure at T+71 seconds. Calls from Telemetry Engineers continued to report a good performance of the first stage, also confirming that the second stage started chilling down its engine for ignition. The Autonomous Spaceport Drone Ship started receiving signals from Falcon 9 around 80 seconds after launch when it appeared above the local horizon. 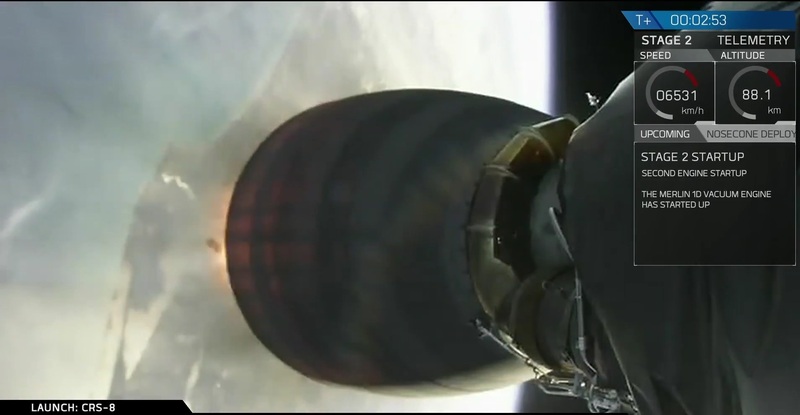 A gradual throttle-back on the nine Merlin engines started after the mission passed T+2 minutes to limit stress on the vehicle as it had already burned the majority of its propellants. The first stage shut down its engines at T+2 minutes and 30 seconds, having lifted the vehicle to 68 Kilometers in altitude and a velocity of Mach 5.45. Four pneumatic pushers separated the two stages of Falcon 9 four seconds after MECO and the interstage adapter cleared the enlarged engine nozzle of the second stage’s MVac. The second stage ignited its MVac engine at T+2 minutes and 41 seconds, soaring to a vacuum thrust of up to 95,000 Kilogram force to finish lifting Dragon into orbit. Flying towards Europe, the vehicle aimed for an insertion orbit of approximately 200 by 360 Kilometers, inclined 51.6 degrees. Although the primary focus of Friday’s mission was Dragon’s ride to orbit, all eyes were once again on the first stage that started its exciting journey back to Earth immediately after stage separation. 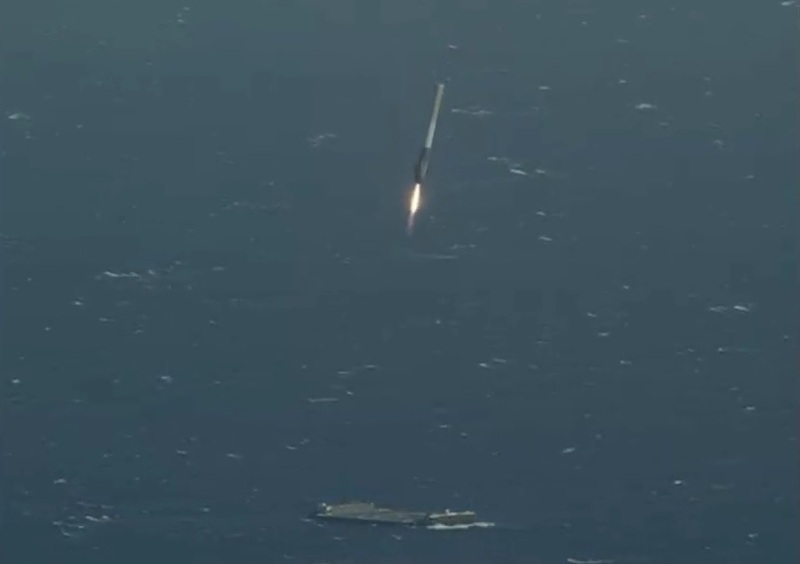 As a flight to Low Earth Orbit, this mission would have had sufficient performance margin to complete a landing at Landing Zone 1 at Cape Canaveral, but SpaceX opted to have another shot at a sea-based recovery which had yet to perfect. A number of first stage landing attempts came close to sticking the landing but ultimately failed due to technical issues that cropped up in the last seconds of flight such as balky Thrust Control Valves, landing legs not locking into place or hydraulic fluid running out. Since upcoming missions will be relying on ASDS landings, the company hoped to finally achieve a successful landing on the drone ship and possibly gather data needed for mastering landing maneuvers in performance-limited missions – a critical requirement for the business model of re-flying rocket stages as cheaply as possible. After a number of close calls when flying boosters to the ASDS, SpaceX was confident of finally achieving success – placing the ASDS ‘Of Course I Still Love You’ in a location 300 Kilometers north-east of the launch pad. 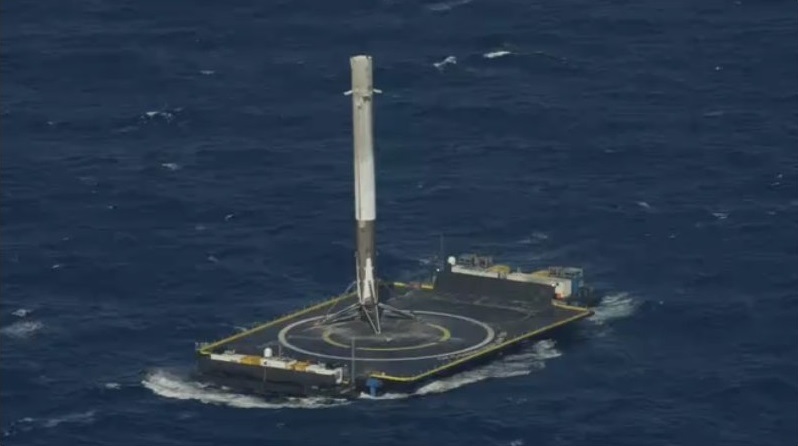 The OCISLY drone ship had to undergo repairs after its last encounter with a Falcon 9 on the SES-9 mission in March which only had a very small propellant margin and resulted in the booster making its way to the barge but failing to cancel out its vertical velocity and punching a hole in the steel deck. Having the luxury of plenty of leftover propellants, the first stage was set for a partial boost-back on Friday. First, the 40-meter long rocket stage used its Nitrogen thrusters to pitch over and point is engines towards the direction of travel with the cold gas thrusters in use to settle the propellants in the back of the tanks for a clean ignition. Three engines of the vehicle successfully re-started four minutes and 20 seconds into the flight on a 38-second boost back burn to reduce the booster’s downrange travel distance, aiming for the ASDS. At T+6 minutes and 58 seconds, the first stage again fired up a subset of its engines to slow down for re-entry and shield the engine section of the booster from the forces occurring at re-entry. The burn lasted around 24 seconds and placed the vehicle on a trajectory towards the precise coordinates of the OCISLY drone ship. Falcon 9 employed its grid fins and state of the art guidance platform to modify the booster’s angle of attack to control the downrange travel distance and to correct any cross-track errors to place the stage close to its intended landing burn target. 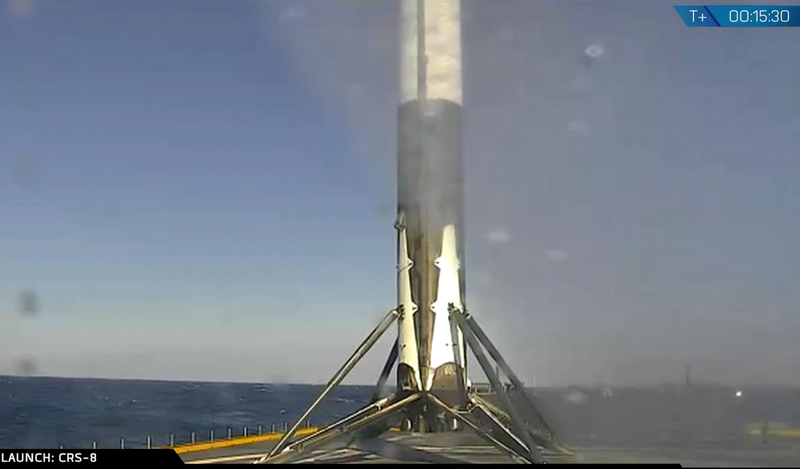 Speeding towards the Ocean at a speed just under Mach 1, Falcon 9 re-ignited its center engine around T+8:05 for the landing burn – set for some heavy throttling and gimbaling action to put the rocket stage into a vertical descent towards the prominent SpaceX logo painted on the drone ship’s deck. Landing Leg deployment was confirmed via the Launch Team Voice Loops and live airborne video from the landing zone. The first stage arced towards the Drone Ship and was rapidly slowed by its center engine. 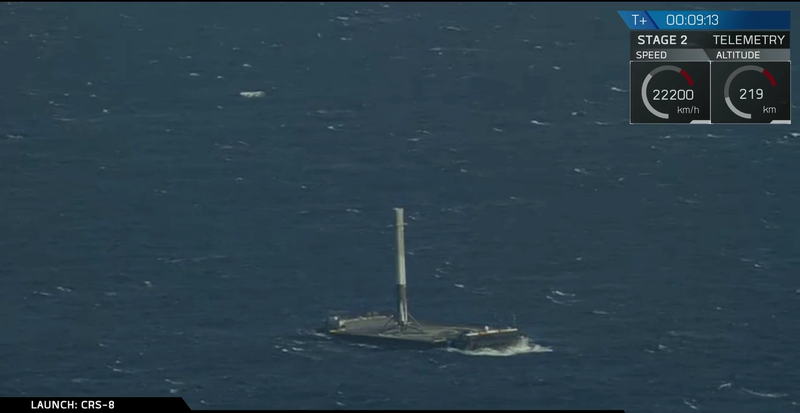 The legs locked in place just seconds before the booster touched down and a few tense seconds passed as everyone watched whether the stage would remain upright. “Of Course I Still Love You, we have a Falcon 9 on board!” was the call from the Launch Team before proceeding with immediate post-landing safing operations. Teams were to approach the barge after the booster transitioned to a safe configuration for an inspection before tying down the vehicle for its return to shore in a few days time. Friday’s successful landing adds another recovered Falcon 9 booster to SpaceX’s collection, coming after the milestone landing of a rocket stage on land in last December’s OG2 mission. Plans for this stage include a detailed inspection after returning to port followed by a number of test firings on the ground to set up for the re-flight of this booster around the June time-frame if everything checks out well. While the first stage’s flight ended with great success, Falcon’s upper stage was in the closing stages of its burn, heading into Terminal Guidance Mode to ensure an on-target orbital insertion, and deactivating its Flight Termination System. Shutdown of the MVac engine was confirmed nine minutes and 55 seconds after liftoff, marking the completion of a flawless ascent mission. The second stage dampened body rates and sent Dragon on its way 10 minutes and 30 seconds after launch, setting out on its high-speed chase of the International Space Station. 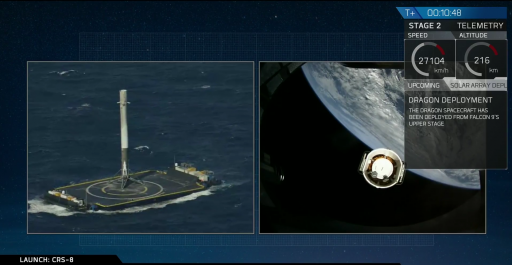 Immediately after release, Dragon pressurized its propellant tanks and began using its Draco thrusters to maintain stable attitude rates for the separation of the Solar Array Covers. 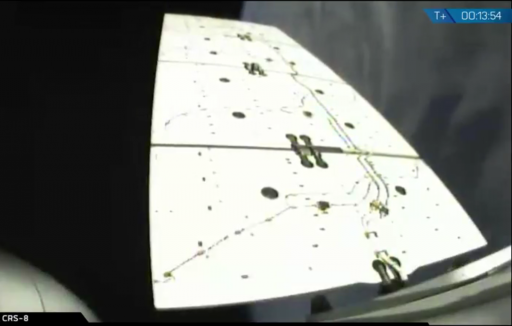 Body rates on the spacecraft were successfully nulled out and Dragon separated its two Solar Array Fairings and initiated the deployment of the arrays 12 minutes into the mission. 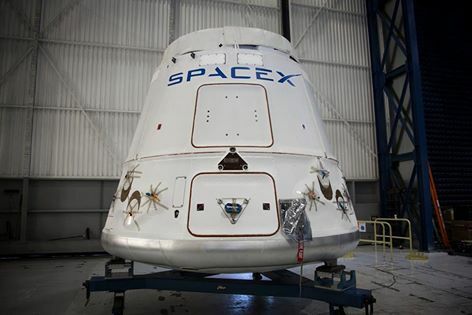 Cameras installed on the Dragon confirmed that both arrays were fully extended and SpaceX Mission Control in Hawthorne assumed control of the Dragon mission. Tracking data showed the Dragon spacecraft in an orbit of 209 x 353 Kilometers, inclined 51.6 degrees, closely matching the target orbit. Friday night will be dedicated to detailed testing of the spacecraft and reconfigurations of various systems to prepare for the rendezvous with the International Space Station. Two hours and 20 minutes into the mission, the spacecraft will open its GNC Bay Door to expose its grapple fixture and the DragonEye rendezvous navigation sensors that will come into play on Sunday when Dragon approaches the Space Station. 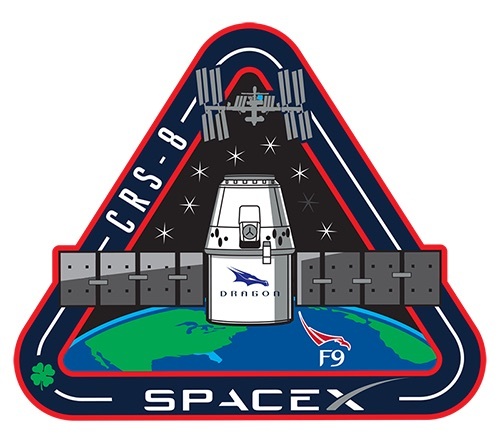 Raising its orbit on Saturday, Dragon will position itself for its far-field rendezvous in the overnight hours to Sunday setting up for capture when Dragon will climb up to ISS from straight below. The robotic grapple of the spacecraft is currently expected at 11 UTC on Sunday to be followed by berthing the spacecraft to the Harmony module for a stay of a little over one month – marking the first time two Commercial Resupply Craft are berthed to ISS with Cygnus already attached to Node 1. Dragon’s mission marks the conclusion of a very busy period for ISS visiting vehicles starting one month ago with the departure of the Soyuz TMA-18M spacecraft and the one-year station crew. Soyuz TMA-20M carried the next three ISS crew members to ISS in the night of March 18 and their arrival was followed just one week later by the Cygnus OA-6 spacecraft, berthed to ISS for the delivery of 3,395kg of cargo. The Russian crew members oversaw a Progress rotation last week to welcome the Progress MS-02 cargo craft with over 2,400kg of supplies.